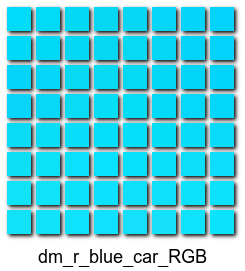 In most digital cameras, each sensor element records either red or green or blue. These are arranged in a mosaic. 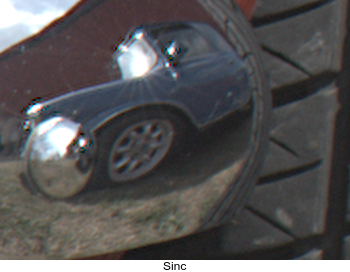 A critical part of processing raw camera images is "demosaicing", which amounts to guessing suitable values for the other two channels at each pixel. I use dcraw for this, as it does a good job. 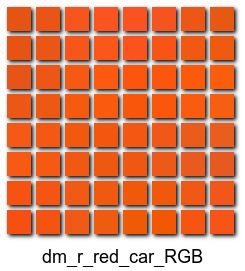 However, we can get the raw mosaic values from dcraw, and demosaic with ImageMagick. This will use a simpler algorithm than dcraw, giving lower quality, but it gives a glimpse under the hood. The method given here processes each of the four channels (R, G0, G1 and B) independently. 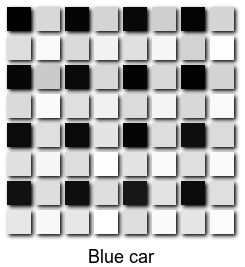 This is a weakness, and makes it more likely to generate false colours at edges than algorithms that assume colour correlation between pixels. 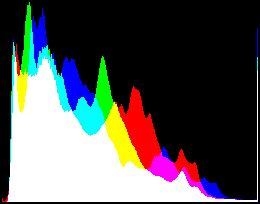 Interpolation of RGB components in Bayer CFA images (from washington.edu). For the simpler inverse process, making a Bayer image from a normal colour image, see my Mosaicing page. On Windows, dcraw.exe is installed in the ImageMagick directory. Otherwise, download dcraw.c from Dave Coffin's website and compile. 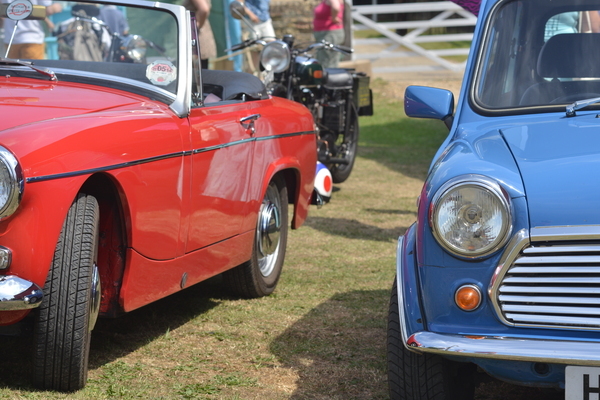 I took a photo of a red car and a blue car, with green grass between them. The camera, a Nikon D800, recorded a .jpeg and a .nef file. Here is the jpeg reduced, and three crops greatly enlarged. 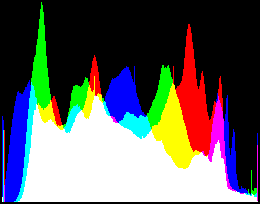 All the histograms on this page are of the full image, not of the web-size JPEG. The in-camera processing has clipped highlights. In normal use, we can tell dcraw to demosaic, and use the camera's white balance ("-w", lower-case w), and create an sRGB output. ImageMagick will complain about some metadata tags. value incorrectly truncated during reading due to implementation limitations. IM v6.8.9-5 complains about dcraw's version of the sRGB profile, so strip it, and all other metadata. 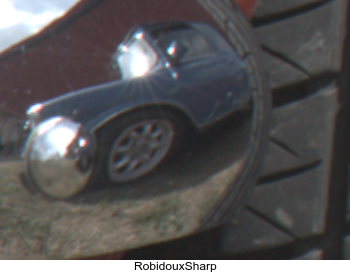 Compared to the in-camera JPEG, this result has slightly darker midtones (the two cars), but lighter shadows (eg the wheel arch of the red car). 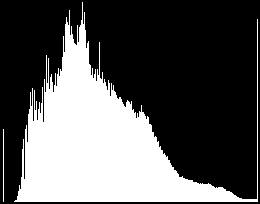 The histogram shows marked clipping. This occurs at the red car's windscreen frame. Statistics shows that 0.6% of pixels are white. 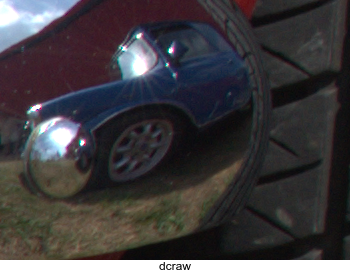 We can tell dcraw to give us the raw almost unprocessed sensor data, and process it with ImageMagick. We do, however, ask dcraw to "automatically brighten" the image, by omitting "-W", upper-case W. "Automatic brighten" is similar to to IM's "-auto-level", but only stretches towards white, and uses bins, and allows clipping. Without "automatic brighten", the maximum value from this image would be 16383. 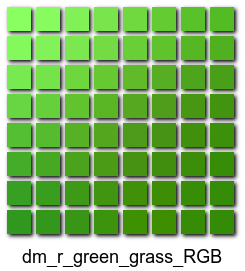 For the web, we convert this to sRGB, and make the crops. It is larger than the JPEG. It is 64 pixels wider and 12 pixels higher. Therefore the crops show different areas. 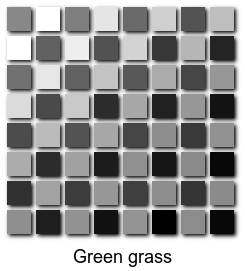 It is greyscale because each pixel has recorded only one of red, green or blue. ... the enlarged crops all show a repeated 2x2 pattern, a Bayer mosaic. Although not clear in this image, there is a border effect on the right-hand side, which needs cropping off. For the red car, the lightest pixel in each group of 2x2 pixels represents the red channel. Likewise for the blue car and blue channel. 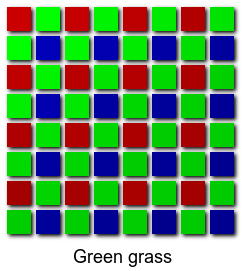 The other two pixels are green channels. To illustrate the effect of the Bayer filter, we can process dm_r_cars.tiff by coloring each pixel either red, green or blue, with the script colmos.bat. 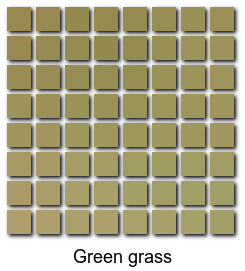 The overall image is tinted green because there are twice as many green pixels than either red or blue. 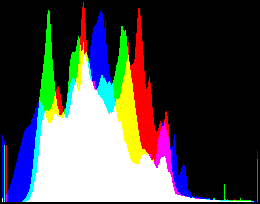 The results are dark because each of the pixels has a value in only one channel. The other two channels are zero. The demoasicing process will spread values from nearby pixels, so those values will no longer be zero. Knowing the Bayer pattern, we can write a script, demos.bat, that demosaics an image. The script makes four clones at 50% size, using "-sample 50%" to get the exact pixel values without interpolation. 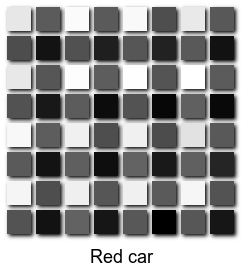 The offsets define which of the four pixels in a group is chosen. For example, "-define sample:offset=75x25" chooses the top-right within each group. The demosaicing is done by "-resize", which stretches each pixel, doubling it in each dimension. Each channel is stretched separately. This primitive method of demosaicing will introduce false colours at boundaries, though these are not visible at reductions made for the web. In debug mode, the script also makes block-pixel versions. Before demosaicing the full-size image, we will consider colour balance. 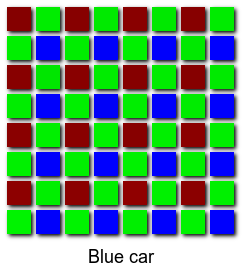 For this camera, the photo-receptors for red and blue are less sensitive than those for green, so the red and blue values need to be multiplied by a number greater than one. In addition, the camera records the redness or blueness of the light. 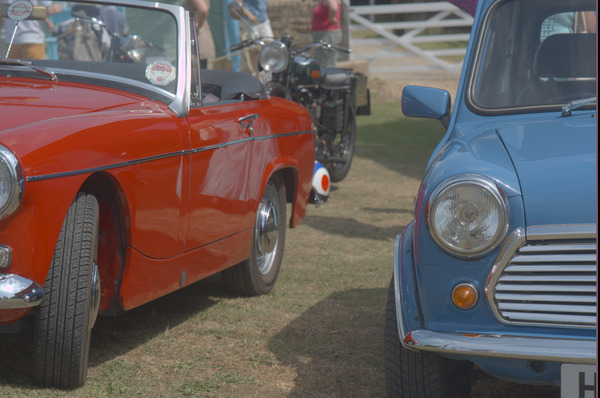 It combines these two effects and writes multipliers for the red and blue channels in exif data. I extract this with exiftool from the original NEF file. These multipliers were automatically used above in Conventional processing with dcraw. The script can use these multipliers. Multiplying a pixel value by nearly 2 might cause clipping. dcraw contains code that can deal with this, eg by reducing all four multipliers by the same proportion, such that no channel quite clips. So we can now demosaic the full image, giving a reasonable result. We also convert to sRGB and increase saturation. The bad pixels on the right edge are more visible now, as a vertical black stripe at the edge. The width varies with different focal-length lenses, being wider with wide-angle lenses. It is outside the advertised limits of the camera, so not a problem. The frame around the windscreen of the red car has clipped. The script could be modified to avoid clipping, for example by finding the maximum values in the RGGB channels and reducing the four multipliers by the same factor such that no channel clips. We can use choose the filter to be used for the resize. 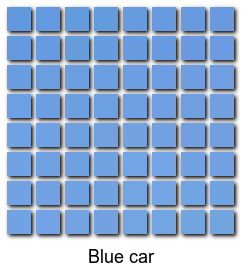 The following code creates a sample for each filter, cropping near the bottom-left of the image, showing the blue car's reflection in the red car's bumper (= USA "fender"). For comparison, we make the same crop from the conventional demosaicing by dcraw, above. Box and Point make a blocky image. Sinc and SincFast create horrible ringing. Cubic, Gaussian, Spline and Triangle make soft edges. Differences between the other filters are more subtle. 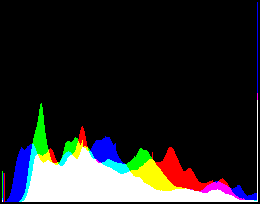 We are upsampling each of the four channels (RGGB). Nicolas Robidoux, Bart van der Wolf and others are developing techniques for minimizing halos when up- or down-sampling. See my page Resampling with halo minimization. I implement one of the techniques in demos.bat. 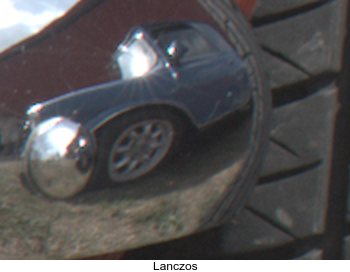 I reckon the "sharpness amount" needs setting to 70 for a similar sharpness to the default Lanczos filter, so my script hard-codes this value. To activate this technique, run the script with dmMIN_HALO set to 1. It slows the script (69 seconds versus 29 seconds). I can't say that I prefer one over the other. If I had better eyesight, perhaps I would. We demosaic and convert to sRGB. We don't bother to make crops. There is still clipping, but less than from dcraw's auto-brighten. ImageMagick can demosaic raw camera images, and it does so quite well. Geometry based Demosaicking, Ferradans et al. 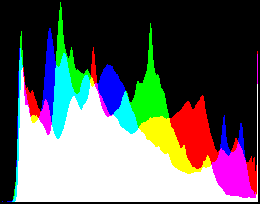 Demosaicing based on wavelet analysis of the luminance component, Menon et al, 2007. We don't need to keep all those large TIFF files, so delete them. 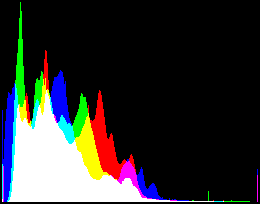 rem From image %1, makes histogram image. rem makes demosaiced image, same size. rem %2 %3 %4 and %5 are multipliers for R G0 G1 and B channels. rem %6 is optional filter for resize. rem %7 is optional output file. @rem   dmMIN_HALO  if 1, uses experimental technique for minimising halos. @rem   dmDEBUG     if 1, creates extra debugging outputs. 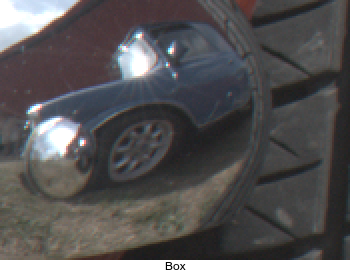 set FILT=-define filter:blur=!deblurValue! -filter Lanczos -distort Resize "%WW%x%HH%^^^!" 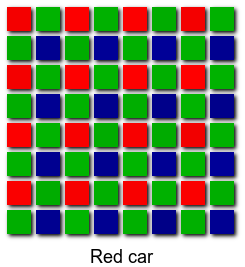 rem colours each pixel with red, green or blue. rem %6 is optional output file. Source file for this web page is demosaic.h1. To re-create this web page, execute "procH1 demosaic".